Warehouse management is a complex task. Find out why benchmarking matters and how your warehouse management software can help you achieve world-class best practices in your business. Benchmarking is a journey: there’s always a way to optimise and streamline processes further. While there’s a common perception that the Middle East and South Africa lag behind Europe and the United States of America (USA) when it comes to warehousing benchmarks, this isn’t the case and as you work through our benchmarking process you'll discover why. What is benchmarking, and why do I need it? The most common mistake businesses make when it comes to benchmarking is not clearly aligning and defining their goals around global industry best practices. In fact when benchmarking, supply chain thought leaders are looking globally to their peers - aiming to provide world-class solutions, not only the best in their specific country. Why? Because customers have more and more options available to them and, thanks to technology, they’re not limited by geographical proximity. Technology and globalisation have made it possible for anyone to do business anywhere in the world. So if you think you’re only competing with other local organisations, you’re mistaken. . .
1. Align your supply chain goals with your business goals, and clearly define these goals. 2. Put in place a strategy and supporting processes which define your warehouse and supply chain requirements. 3. Make sure you have access to quality data to help guide your decision making. The Warehousing Education and Research Council (WERC) website is a great resource to assist you when benchmarking your warehouse. 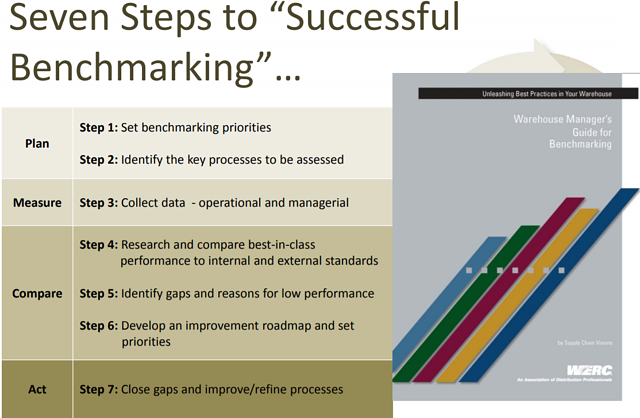 They break the benchmarking processes down into four categories (plan, measure, compare and act) and suggest seven simple steps for successful benchmarking. You can download the full WERC Warehousing & Fulfillment Benchmarking & Best Practice Guide from their website. The main difference between warehouse operations in third and first world countries is that warehouses in the USA, Europe, etc use automation extensively to perform most of the work. This is due to the high cost of labour and significantly higher order volumes. However, the Middle Eastern and Southern African markets aren't ready to implement fully automated warehouses as labour is inexpensive and volumes are much lower. In this respect, we’re about five to ten years behind our peers in Europe and the USA. One of the more realistic ways to ensure that your warehouse is following global best practice, is to invest in a warehouse management system (WMS). The right WMS can greatly improve your supply chain productivity and efficiency. Your WMS does so much more than just keeping track of inventory levels and locations. Advanced warehouse technology provides the you with the tools you need to be able to achieve world-class best practices. How? By giving you access to quality data, automation tasks and resources which can guide your decision making. Data can tell you what you need to know about the health of your warehouse operations. Modules such as Labour Management can pinpoint exactly where time is being wasted, and make recommendations which speed up the process. For example, switching from single-order picking to multiple-order picking. Your WMS can also make recommendations about labour allocation and, through unique personal access codes, improve your warehouse safety and security. By streamlining your processes and labour allocation, you’ll be able to deliver better customer service, while reducing your operational expenses. Having access to quality data will also allow you to implement continuous development in your business, allowing you to be proactive rather than reactive in an increasingly competitive market. You’ll be able to predict and measure trends, allowing you to constantly tweak your processes to maintain maximum operational efficiency. By implementing a WMS that utilises the latest warehousing technology, you’ll place your business at the forefront of change, in line with global industry leaders. The right WMS can help you tackle some of the key challenges that warehouse managers face on a day to day basis.